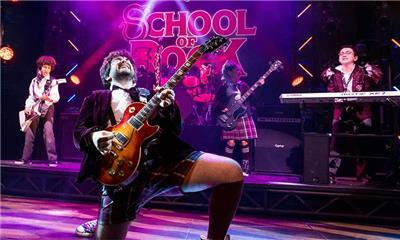 SCHOOL OF ROCK, the hit Broadway musical from Andrew Lloyd Webber. Based on the iconic, hit movie, this irresistible new musical follows Dewey Finn, a failed, wannabe rock star who decides to earn an extra bit of cash by posing as a supply teacher at a prestigious prep school. There he turns a class of straight–A pupils into a guitar-shredding, bass-slapping, mind-blowing rock band. But can he get them to the Battle of the Bands without their parents and the school’s headmistress finding out?